Sometimes I strike a strange balance between analog and digital when it comes to my work habits. I love Google Drive and Evernote, but part of my learning process when I’m trying to squeeze as much as possible out of a book or article is to write it down in a single subject notebook. Then it gets transcribed into the digital space (such as Evernote) – so I’m reading it twice, writing it twice. It’s stuck in my head pretty well after that. When it comes to tasks and goals, I’ve tried so many different to-do list apps and programs, but nothing beats a piece of scratch paper or a bit of my calendar spread for writing down what needs to get done – the satisfaction of the highlighter swipe across the task is much more fulfilling for me than clicking “Complete” or “Done” on a screen. I did this with my E-Portfolio for my MLIS in the fall of 2013 (see image to the right). I set goals for myself, based on percentages and given dates, and wrote down the date that I got the email back from my professor saying that I had completed the corresponding competency to her satisfaction. 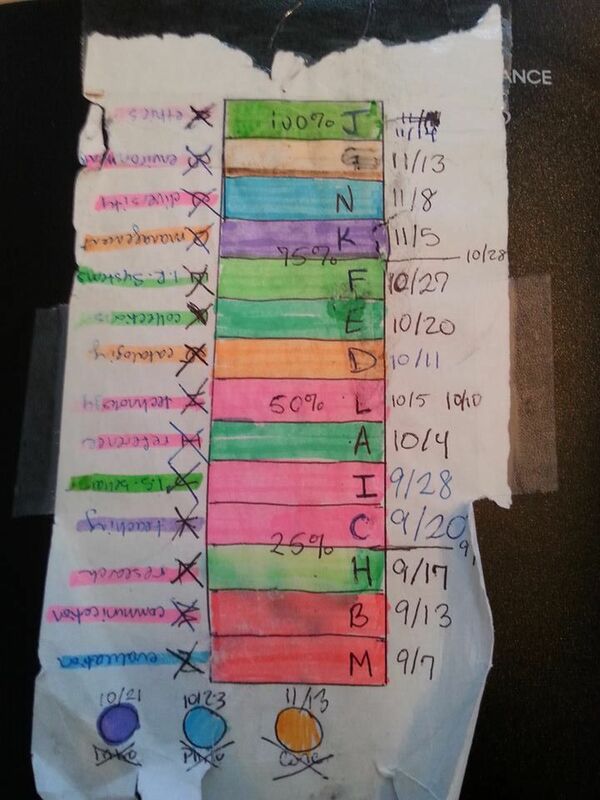 On November 14, 2013, when I finally filled in J with a green highlighter and wrote the date, I was immensely pleased with myself. The balance I’ve struck works for me. It’s not fancy. It’s not techy. But it generates the right amount of “small win” achievement-based motivation I need to tackle large projects.